Cancer treatments: A doctor's take on alternative and natural regimens. Do Doctors Ever Treat Cancer With Natural Regimens? 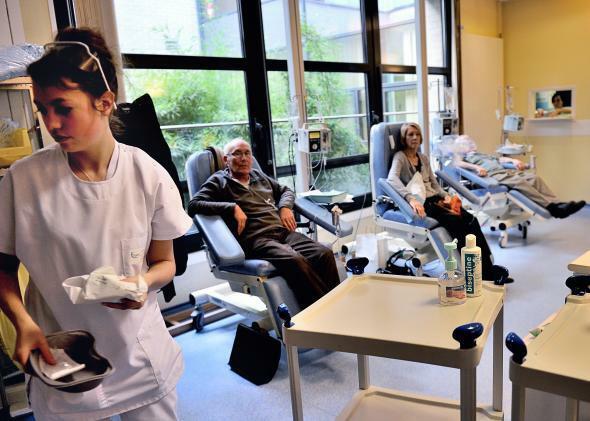 A chemotherapy treatment center in France. Science! I believe in treating cancer with anything that works. Show me that something works, and I’ll use it. Period. But don’t give me a story of how someone’s aunt’s best friend was told that she had six months to live and was cured by taking a natural supplement found through the Internet and is still alive 10 years later—and then ask me to give the OK to try it. Some cancer patients have the great misfortune of having a cancer that is very advanced or poorly treatable by anything. For them, it doesn’t make a great deal of difference what they do, with the exception of some considerable out-of-pocket expenses if they see someone particularly unscrupulous. But I’ve seen my share of patients with very curable cancers who elected to go the “natural” or the “holistic” or the “alternative” route and then come back to see me with an advanced incurable disease. That’s really tough to swallow for them and for me. Don’t give me anecdotes. Show me the data. Give me 200 to 300 patients with biopsy-proven cancers. Yes, biopsy-proven. Because I see patients all the time who are told they have cancer, but when the biopsy is finally done, it’s something else. Let a computer select half of them to get the “natural” regimen and the other half to get standard cancer treatment. No, that’s not remotely fair to patients. How about giving all of them the best standard treatment and then having the computer select half of them to also have the “natural” regimen? Will it have any positive effect? Show me the results. If the “natural” stuff works, I and most other cancer specialists will use it. No one likes surgery, radiation therapy, or chemotherapy. But advances have made all of these treatments more effective and more tolerable. These treatments have scientific proof behind them. Don’t give into magical thinking. A sad story: A while back, a mother came into the emergency room at UCLA. My colleague (who is now a world-famous cancer specialist) and I were asked to see her in the emergency department. Her husband had brought her in with a large ulcerated infected cancer in her breast. The cancer was very advanced and had entirely replaced her left breast and had grown down her chest wall. The odor was horrific. The cancer was obviously widespread, and she was in really bad shape. They had three kids at home. Poor woman. Poor family. “She found it about five to six years ago,” he said. “What treatments has she had?” I asked. “She’s been taking different natural remedies and putting a salve on her breast to make it go away,” he replied. “She’s been doing this for five years?” I asked. “And it’s been working?” I asked. “At first it seemed to work. They told her it would take time, and eventually she would be all right. But this past year it’s not working,” he said. A long silence followed that seemed to last minutes. I looked at her and wondered if she and her husband would accept chemotherapy. And then I thought that she might even be too ill, too weak, to receive chemotherapy. But she would die either way. And then I thought that maybe I could bring her into the hospital and give her chemotherapy as an inpatient that day. I wanted to do something. Maybe I would call a surgeon to biopsy her breast. But maybe I didn’t need to do that because it would take days to get a result and I wanted to treat her right away. But chemotherapy doesn’t work very well in this kind of situation, and I hadn’t yet seen her labs tests. She looked terrible. Was her calcium elevated? If so, maybe I needed to treat that first. Did they get a chest X-ray? Who had the data? But what if this poor woman wouldn’t agree to chemo? How much difference would it make? My colleague, who hadn’t said a word after initial introductions, interrupted my thoughts by suddenly handing me his pager. “Dave, can you take my pages for an hour?” he said. I took the pager with a puzzled expression. “Sure, John,” I said. “Get the name and address of this healer. I need to go home and get a hammer. I’ve got a couple in the garage,” he replied. Are there any proven links between alkalinity and cancer? What are the latest and most promising cancer fighting drugs/treatments on the market? Is it true that oncologists refuse to be treated for terminal cancer?